In my mission to go from Kanyakumari (the very southern tip of India) to Kathmandu overland, 147 hours in transit over 32 days had brought me 6,712 kilometers to Darjeeling. The last leg of this overland adventure was just around the corner as, from Darjeeling, I could make it to Kathmandu in one (rather long) fell travel swoop. After my mini-trek, I had taken a “rest” day in Darjeeling to generally get myself together before tackling this last leg… I ran errands, did laundry, got a haircut, ate some good food, etc. The timing worked out nicely as my friend Ben, whom I was meeting in Kathmandu, wasn’t arriving until the 7th of April, so I had an extra day to relax somewhere as I ended my trek back in Darjeeling the night of the 4th (whether that day was in Darjeeling or Kathmandu was kind of my choice, but after the mini-trek, I just wanted to not move locations for a day). So I woke up bright and early (6 AM) on the morning of April 6th to start one last long travel push. Despite Darjeeling being very near the border with Nepal, the border crossings nearest to Darjeeling don’t issue Nepalese travel visas, so unless one already has one (which I did not), you have to go south and cross the border at Kakarvitta. The way to begin the journey to Kakarvitta is to take a shared jeep down to Siliguri (the same ride in the opposite direction of the shared jeep ride I took to get to Darjeeling). I packed up my things, left the hotel, made my way down near the bus station (where the jeeps gather) and managed to find a jeep by 7 AM. The driver managed to find enough passengers to make the run profitable by around 7:30 and we were off. Now, on the way up, I had a middle seat in the back row, and given how lowly set the windows are in these jeeps (i.e. being as tall as I am, the I can’t see much as I have to look down or slouch to see out… and there’s generally no room to slouch the way they pack these jeeps with people), I didn’t get much of a view. On this ride I managed to get myself a window seat and got to enjoy the views going down the mountain, so it made for a nicer 3 hours, visually, then the ride I had on the way up (no other westerners to chat up though). We stopped at a roadside stand 2/3rds of the way down for a toilet and food break, which was nice as I hadn’t eaten breakfast yet. The jeep made it’s way down to Siliguri and the driver dropped me off near the street where the shared jeep rides gather to head off to other destinations… Kakarvitta being one. Now, walking around the jeep stands just invites the hawkers out (I don’t think being a westerner has anything to do with it as they yell at every random person on the street that even remotely looks like they’re looking for a ride to fill all of their seats), which is actually pretty useful as all I have to say is “Nepal, Nepal” and I’m directed to a shared jeep headed that way. My impeccable timing worked perfectly as I was the last one on board, so the jeep took off immediately without having to wait around to fill the sucker up with the full complement of passengers (which is 10 by the way, two in the front seat, four in the middle and four in the back… all bags are tied to the roof). As an aside, being slightly geographically ignorant, I figured that since Nepal is known for the Himalayas that I would have been headed back up the hill, just in a different direction, to get to the Nepalese border… and I was slightly confused by the terrain I was seeing above. But, after consulting with my guidebook, the part of Nepal bordering India to the south is primarily plains before the Himalayas start rising up (about 1/3rd of the way through the country north of the southern border). I crossed into Nepal and was dropped off at their border checkpoint to get my visa, which I got after more requisite form filling out ($100 USD plus 200 Indian rupees for a 90-day tourist visa). I changed my Indian Rupees into Nepalese Rupees with the border guard who gave me my visa (I don’t know the legality of this, but I wasn’t going to ask) and walked into town to find my travel agent. You see, for a myriad of reasons, I had bought a bus ticket from a travel agent in Darjeeling… so I went to find the corresponding travel agency in Kakarvitta, which I did. Now it was about 1:30 PM by this time and the bus wasn’t leaving until 5 PM (interesting note, Nepal’s time is actually 15 minutes ahead of India’s time, so I had to add 15 minutes to my watch even as I was traveling west from India into Nepal). I holed up in a hotel restaurant with wifi and waited it out (Kakarvitta is a small dusty border town with nothing to see… unless you’re really into walking around small dusty border towns… in which, case you must be furious with me for missing out on that opportunity… but hey… I’m not into it and okay with my decision). I made my way back to the bus company at 4:30 to have one of the employees walk me over to the bus yard and show me my bus (and then, once seated, to have him stand there for 15 minutes asking me for 50 Rupees for a tip for showing me the way… I finally, after a few choice words, gave him a 20 just because he wouldn’t go away… which I guess shows a bit of the power of persistence . The bus was nicer than I thought it would be (i.e. basic Greyhound quality, sans toilet… but I had paid for the “Deluxe A/C” bus… just sometimes that doesn’t mean what you think it should mean in other places). 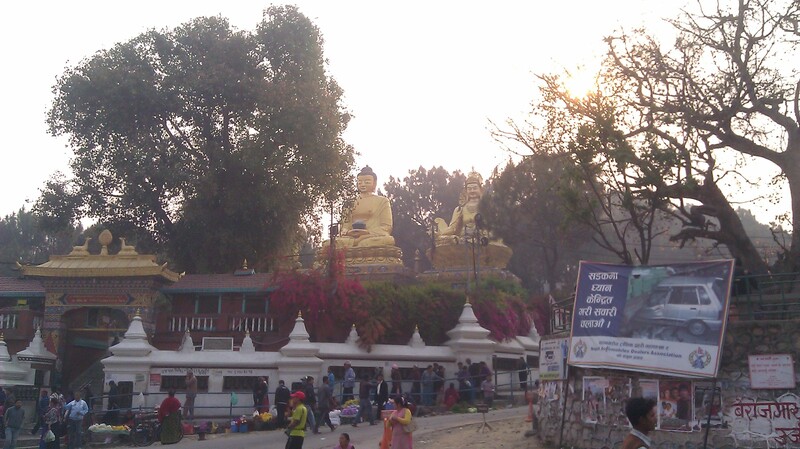 At 5:05 PM the bus was off for Kathmandu. I hadn’t eaten since lunch (which wasn’t all that big), so I just watched what some of the bus employees were eating and got the same thing (I watched on guy go down the line of prepaid food testing the temperature of each thing, then selecting only two of the five available and only one type of the various breads… I figured he didn’t want to get sick either and knew what he was doing). As an aside, I generally drink (and eat) very little on these long bus trips as I’d rather be dehydrated the whole time than the opposite when there’s no toilet on the bus. I scarf down some food and we’re all back on the bus in 10 minutes. We watch another movie (with another ten-minute roadside stand break around 10:45 PM). After the second movie, it’s lights out around 11:30ish (although people were already asleep). I had left my last set of earplugs back in Darjeeling (as I discovered earlier on the bus ride), so I wrapped my scarf around my head, leaned back and tried to fall asleep. Similar to my last overnight bus ride experience (Goa to Bombay back in February), there was constant swerving, honking, breaking, accelerating and careening around corners and over potholes… but (I’m much better in this regard, after this last month here) instead of worrying how little sleep I was going to get, I just smiled at how ridiculous this whole trip has been and figured what’s one more uncomfortable night… I managed to sleep fitfully, at best (which isn’t bad, for me, on a ride like that). Every three odd hours or so, the bus would pull over for a restroom break in some seemingly random dirt lot and everyone (well, most) would stumble out and back on rather quickly. The sun came up around 5:30ish… by that time, the bus had started up the mountains, so the view was actually pretty good. I started to notice that the road signs seemed to indicate we were close to Kathmandu, and once the surroundings started to appear to be “urban” I was almost giddy with excitement that we’d be early… way early actually when compared to my estimated 11:00 AM arrival expectations, which would have been a very nice surprise… but then… well… the universe just wanted to have some fun with me (and everybody else). 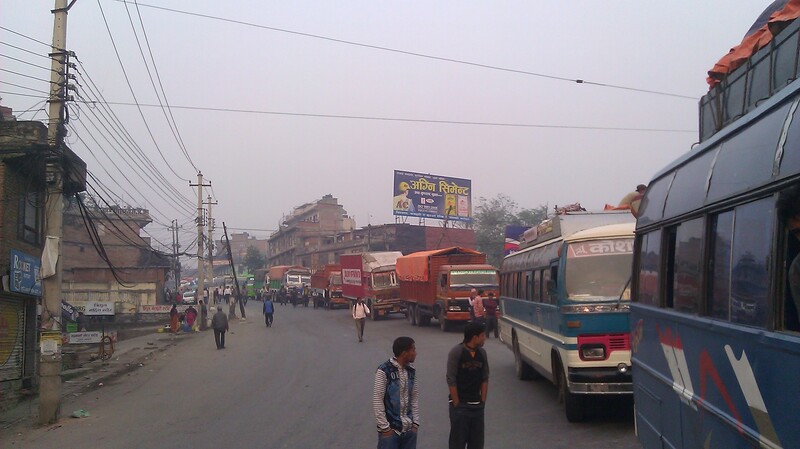 As we approached central Kathmandu all of the traffic stopped… similar to this, but in the city. There must have been about 100 buses sitting on the side of the road, which is what our bus did when the driver realized he could go no further. A strike had been called for that day, and the strikers weren’t letting any vehicles (sans police and government cars, and seemingly anyone on a motor scooter drive anywhere. Shyte. I got off the bus with everybody else and started asking around about what was happening. Two Indian tourists and a Nepali took me under their wing as they tried to figure out what was going on where we were (as we were stopped in some street in greater Kathmandu). They figured out where we all were and called their friends to given them an update on what was happening. I followed them up the road for a bit, and they all suggested I just stay in the area for the night as that might be easier. But since my friend was flying in that day and we had arranged to meet at a certain guesthouse in the center of town and it was only about 6:45 AM, I figured I’d at least try to get where I was supposed to be going. So I asked them to ask the locals where “Thamel” (the neighborhood in which I was supposed to stay) was… and folks gave the general direction and indicated that it was anywhere between a 45 minute and 2.5-hour walk. Now… I was carrying my bag, so that sucked, but I figured if the worst that could happen was that it’d be a 2.5-hour walk I could get there just fine (as it was early, it was still pretty chilly, which isn’t a bad thing for a long walk in an unfamiliar place while carrying a big bag). So, despite the protests of my new found friends (“you want to walk there?”), I set off. Every twenty minutes of so I’d ask a local where Thamel was, and based n their gesturing broken English and them speaking to me in Nepali, I got the hint and kept on walking (I used the only Nepali word I knew, which was the greeting “namaste”… if they’d reply. I would keep repeating the work “thamel… thamel…” until they understood what I was saying, where they’d then break out into the gesturing and, mostly, to me anyhow, gibberish). 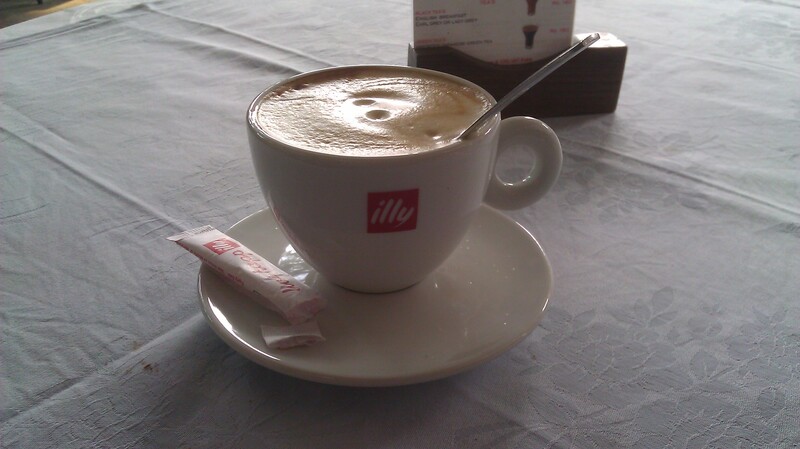 After about 1.5 hours of walking (non-inclusive of one chai and one breakfast stop) I finally made it to my guesthouse. I was happy to finally be in Kathmandu and looking forward to seeing my friend (Ben got in just fine as they were running buses and taxis to and from the airport despite the strike). 4/6: Two Shared Jeep rides from Darjeeling to Nepal Border: 4.5 hrs. 145 kms. 250 Rps. 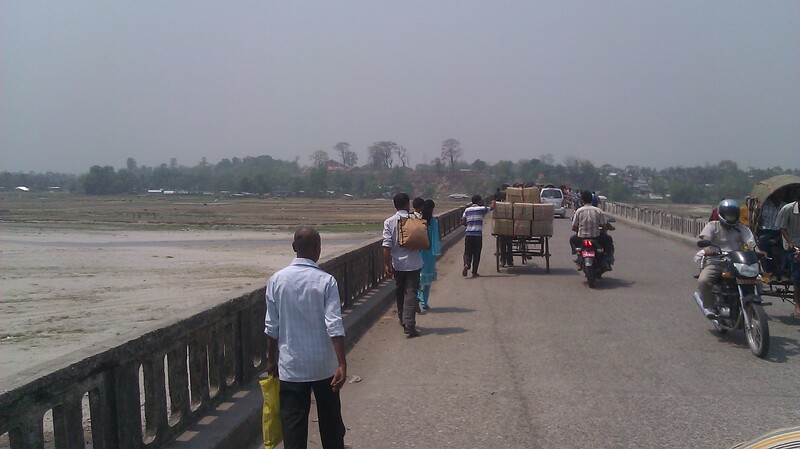 4/6: Overnight nus from Nepal Border to Kathmandu: 14 hrs. 1,015 kms. 1,500 Rps. 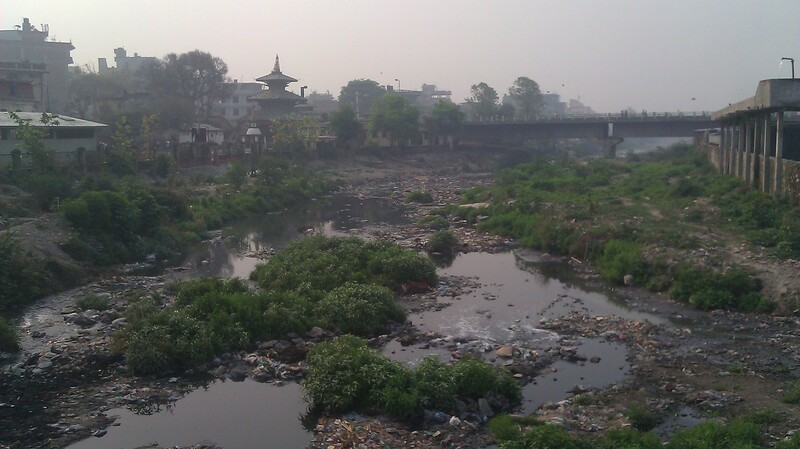 4/7: Walk to Hotel from Strike-Stpped Bus in Kathmandu: 1.5 hrs. 5 kms (estimate). Free. Sub-Total (4/6-4/7): 20 hours in transit to cover 1,160 kms (720 miles) over 2 days for 1,750 Rps ($32.40 USD). Grand Total (3/3-4/7… from the southern tip of India to Kathmandu): 167 hours (just shy of one full week) in transit to cover 7,872 kms (4,880 miles) over 35 days for 12,687 Rps ($232.80 USD)… or $0.03/km at the warp speed like rate of 47 kmph (29 mph). Keep in mind that the above is just time actually in transit, I’m not including the many more hours spent waiting for trains/buses/jeeps or for transfers (which would likely push the total well over 200 hours). My final guidebook checklists… of the 35 Things Not to Miss in India from my Rough Guide guidebook, I have now seen #’s 3: Kerala Backwaters, 4: Ajanta Caves, 5: Taj Mahal, 9: Khajuraho, 11: Orchha, 15: Kochi, 17: Cricket (in Mumbai), 21: Madurai, 23: Hampi, 24: Ellora Caves, 26: Varanasi and 35: Palolem Beach (Goa). Of Lonley Planet’s Top 20 Experiences I’ve done #’s 1: Taj Mahal, 2: Kerala Backwaters, 3: Varanasi, 4: Darjeeling, 5: Ajanta Caves, 6: Hampi, 7: Riding the Train, 9: Hill Stations, 10: Neighborhood Markets, 11: Goan Beaches, 12: Mumbai’s Architecture, 14: Wandering the Streets, 16: Khajuraho, 20: Delhi. Honestly… while I’m glad I did this and survived, I’m glad this little overland jaunt is over. Although I’m sure I still have some long bus rides ahead of me in Nepal, they’ll be nothing like the continual motion of the last month. 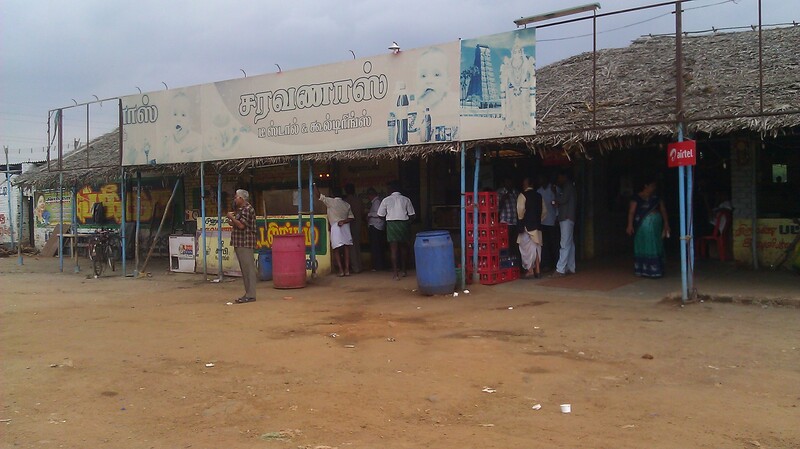 This entry was posted in India, Kanyakumari to Kathmandu Overland, Nepal by Richard. Bookmark the permalink. You my friend are amazing……….